I’ve read about other designers experiencing swatches that lie, but had not yet had the pleasure myself… until now. I just finished up the new sample of my next pattern using the Stroll Sport yarn Knit Picks had sent me. I had already finished another sample using another yarn and everything came out fine. The pattern had already been written, edited and tested so it should have been really straight forward. I should have known something was wrong, and stopped what I was doing immediately, when I blocked the piece and was unable to get the garment to comply to the schematic measurements. But I pressed on and even sewed on all 15 buttons. Then I decided that it might be a good idea to re-check my gauge. I measured it in 6 different places and then averaged it out… and the result was not pretty. The row gauge is actually 7 stitches per inch rather than the 8 stitches per inch that I used for all my calculations. Do you know what this means? If I was just knitting this piece for myself then I could just say, “Meh, close enough, it’ll still fit.” But since this is my design it really needs to be right. So, the only solution I can see is to redo the math, change the numbers in the pattern, and… wait for it… rip the sample back to the end of the yoke and start again. I’ve heard the advice to check the gauge after you begin knitting, but it hadn’t quite sunken in until just now. Off I go to rip and rewrite! I have officially received my first rejection letter from a submission call. I had submitted two design ideas for the Knit Now Fall 2013 call but they didn’t make the cut unfortunately. I was disappointed, but surprised that I wasn’t more upset. I’m still feeling my way around this industry and trying to figure out where I fit in. I don’t think it’s the worst thing in the world to take these ideas in a different direction and go the independent publication route that I’ve taken thus far. It can be much more lucrative if the pattern catches on. I think it’s time to make a business plan and start getting myself organized! And, hey, I still have a couple of other ideas submitted to another publication to hear back from. Fingers are still crossed. For better, and worse, I got a new camera. It’s better because my day-to-day pictures are going to be much better than the ones I used to take on my phone. It’s worse because I’m also going to try to do my own pattern photography now, which in no way will compare to that of my previous photographer. I’m going to take some classes and practice a lot, so hopefully it won’t be too long until it’s passable for “photography”. The new camera is a Sony NEX 6, a Mirrorless Interchangeable Lens camera. I like it because it’s not as big and heavy as a DSLR, but it’s can still take great photos and I can change out the lens for others more suitable for the photography I need to do. I’m pretty excited, but also incredibly intimidated. Bear with me while I learn the ropes! In the meantime, here is my first blog photo with the new camera. I received my very first yarn support today! 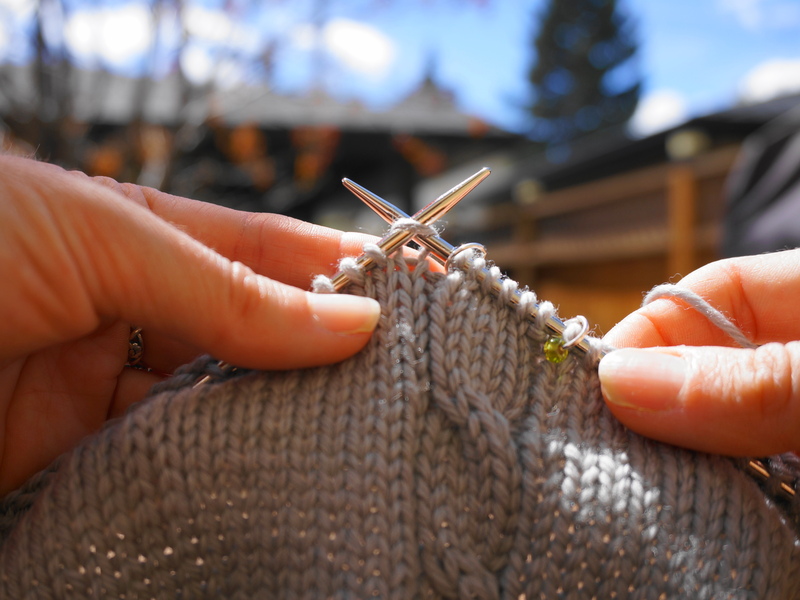 I found out last week that my next pattern has been accepted by Knit Picks for their Independent Designer Partnership (IDP) Program. What that means is that they send me yarn, I write the pattern, knit and photograph the sample and send them the pattern and photos. They sell the pattern on their website and I get 100% of the proceeds. I get great exposure for my pattern and another venue for selling it, they get a good opportunity to sell more yarn. Great deal all around. 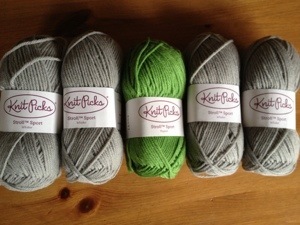 So in the mail today I received 5 balls of Knit Picks Stroll Sport, 4 in the whisker colourway, 1 in peapod. The yarn is lovely and soft, I can’t wait to get started knitting. I have been on a bit of a knitting hiatus for the last few weeks. I have submitted some design ideas to a couple of magazines and am pondering a couple of others. After the flurry of activity to get the submissions together I’ve taken a bit of a breather in the hopes that there will be another, bigger flurry of activity if some of my ideas get accepted. In the meantime, I’ve got a sample to knit with some pretty (and free) yarn!